Impressive success for Rory Gallagher’s team in Newry. Patrick McBrearty impressed for Donegal tonight in Newry. 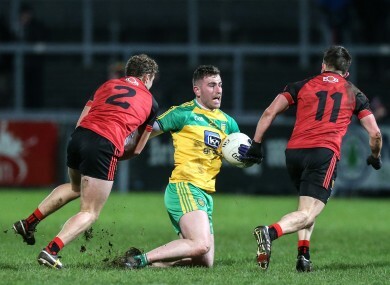 IT WAS A brilliant night for the Donegal footballers tonight in Páirc Esler in Newry as they ended a seven-year wait for an away victory in Division 1 of the Allianz football league in some style. In the process they ensured it was a miserable start to life in the league for new Down boss Eamonn Burns as his side were humbled by their Ulster opponents. Ryan McHugh and Patrick McBrearty pounced for the goals early in the second-half that paved the way for Donegal’s victory while McHugh would hit the net again before the final whistle for his team’s third goal. It was 0-9 to 0-3 in Donegal’s favour at the interval with goalkeeper Peter Boyle doing his bit for Rory Gallagher’s side when he stopped a Donal O’Hare penalty in the opening half. Michael Murphy, who struck 0-8 overall, excelled for Donegal and they killed the match off with those early second-half goals. Both teams finished with 14 men as O’Hare saw red late on while Eamonn McGee received a black card for the same incident, and by that stage Donegal had already used their full quota of substitutes. Scorers for Donegal: Michael Murphy 0-8 (0-8f), Ryan McHugh 2-0, Patrick McBreraty 1-3 (0-1f), Leo McLoone 0-2, Frank McGlynn, Ciaran Thompson 0-1 each. Scorers for Down: Donal O’Hare 0-4 (0-4f), Arthur McConville 0-2 (0-1f), Conaill McGovern 0-1. Email “Donegal destroy Down to claim opening night 17-point football league win”. Feedback on “Donegal destroy Down to claim opening night 17-point football league win”.